Last week, we started poking at SparkFun’s new LumiDrive LED Driver and played a little with the available digital pins broken out on the board. This week, we’ll take a look at the analog pins, play with them as inputs, and see if we can put something together using both digital and analog pins. If you didn’t catch its release, let me introduce you to the SparkFun LuMini LED Driver. This board boasts a SAMD21G-AU microcontroller, to allow you to run Python, micropython, circuitpython, etc. 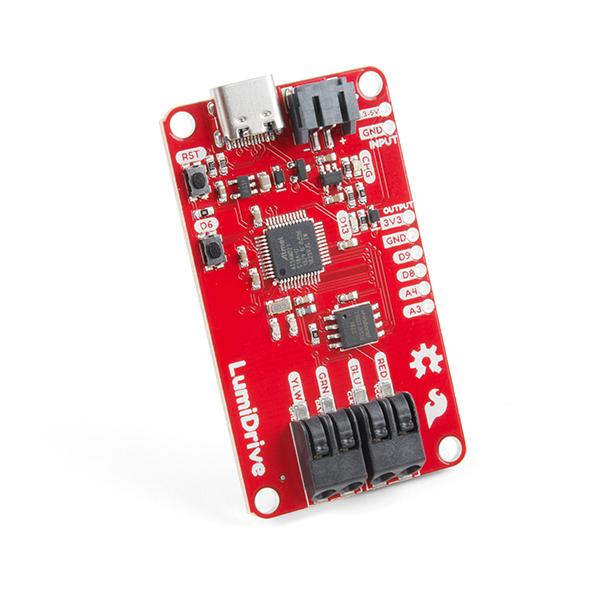 The SparkFun LumiDrive LED Driver. So powerful. So elegant. So red. Let’s dig into analog input on the LumiDrive. The first thing we need to do is import the proper library. So just as we imported the digitalio library to read and control things connected to the digital pins, this time we’ll need to import the analogio library. 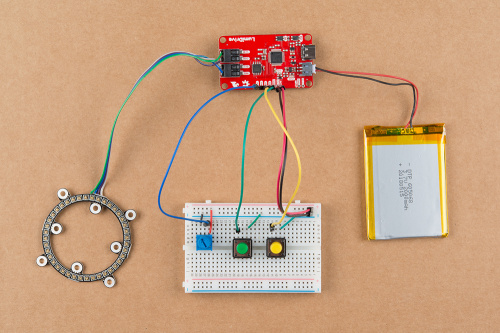 If you're coming from the world of Arduino (or C), you would expect the analog value coming in from your potentiometer to be somewhere in the 0-1023 range – and you would be correct. However, things are a little different here. Your analog reading will fall within the range of 0-65535 (assuming 16-bit), so there's a much higher resolution. Let's say we just want to see what value our trim pot is returning. Well first, of course, we need to attach our potentiometer. The hookup to the LumiDrive is simple, and just as you would expect. The outside legs of your potentiometer go to 3.3V and GND, with your center leg going to an analog pin. In this case I'm using A3. The pin.value call will return the raw data from your potentiometer, so with a simple sketch, we can see what our potentiometer is telling us. Once you've saved that sketch to your LumiDrive (as main.py or code.py), you can open up a serial terminal and you should see something like this. Could not find an attached device. Make sure the device is plugged into this computer. Blah blah blah other important things. For the time being, I'm simply using TeraTerm. You should have no problems with TeraTerm, CoolTerm or whatever your favorite terminal program happens to be. Now you probably notice that the value never gets all the way down to zero. With a resolution of 65535 across its rotation, and the little bit of float, that is to be expected. There are ways to eliminate that, but that's an issue for a whole different post. A potentiometer is a means to an end. That is, the values returned from a potentiometer are generally not as exciting as what we do with those values. Let's consider a few ideas. Suppose we want to know the voltage going through our potentiometer. Since we're on a 3.3V setup, we'll want to take the returned value from our pot, multiply it by 3.3, and then divide it by the full range of our potentiometer. So it's not just a stream of numbers flying by, let's tell the casual observer what we're showing them. Try this. Notice that to print a string and a variable together, you just need to add a comma between the two. Now what if instead of voltage, you want to change your RGB values? Just like with the voltage indicator, you simply need to multiply the pin value by the number of your desired range - in this case 256 - and then divide it by the potentiometer's resolution, 65535. Returning a value in the range of 0-255. But come on, your LED isn't interested in (0, 255, 87.6239). Of course, this gives us a float, when we really just want an integer. There are a few different ways to do this, and if you have a favorite, or you think my way is terrible, please let me know! For this example, I'm going to use the truncate command from the math library. Remember, we can either import the entire math library, of just the part we need. Ah, now that's more like it. Integers as far as the eye can see. We've only seen our values returned to us in our serial terminal window. Let's try to make something happen that doesn't need a computer screen to show results. # This function takes a color and a delay and fills the entire strand with that color. # The delay is given in the case you use multiple color fills in a row. You'll notice a couple of things in this last example. The first is that while we defined functions to get our analog values in all of the previous examples, we did not in this one. To read our time.sleep variable, we read the analog_in.value within our while True loop. I did this because Python can't convert a function to a float, and the time.sleep call expects a float as its argument. Second, in getting the value for our time.sleep, I've multiplied our analog_in value by two before dividing it by 65535. This sets our maximum sleep time at two seconds, just like multiplying by 3.3 in the earlier example gave us our voltage range. But not this week. Again, this is mostly geared toward those among us (myself included) who haven't done much Python programming as it applies to the physical world. I'm sure there are better or more efficient ways to do exactly what I've just done, and since as long as I'm still breathing, I'm still learning, I'd love to see your suggestions and improvements in the comments. I also recall saying last week that if all went well, I would try to use all of this in some sort of practical application or project. Well, things went well, but not quite that well. I have a head full of ideas as to how to use all of this in a build, but this week there just wasn't enough time, so that will be a post for another day.